Looking for luxury villa's for rent in Malta? Our real estate professionals are here to help you find the perfect luxury villa in Malta. While packages are by their nature, designed to appeal to a broad cross section of travelers, when it comes to plan-your-own, a little more thought is needed if you are considering a stay in one of the many apartments or villas in Malta or Gozo. Will you be visiting as a couple, family with children, or as part of a larger group of friends? Are your holiday preferences to be in a quiet area? Would you prefer to relax around your private pool during the day, before enjoying romantic meals on balcony or terrace in the evening? Or maybe you would rather be more central, getting out and about, exploring the architecture and museums, and becoming immersed in the local culture while sampling our Mediterranean cuisine. In the evening perhaps dressing up and enjoying the nightlife in Paceville and Bugibba; eating, drinking and dancing until the early hours. 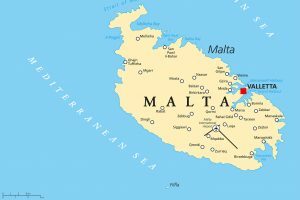 Considering you can reach any area of Malta within about 30 minutes by car, location is not such an issue as it can be in other countries. With Gozo being even smaller, you are pretty much at the centre of things wherever you choose to stay. Comino is vehicle free and uninhabited except for a tiny hotel. Situated between Malta and Gozo it is popular with day-tripping walkers, divers and photographers, and is easily reached from either island. We have villas in all areas of Malta and Gozo with private and communal pools to ensure your holiday preferences are catered for. The island’s capital of Valletta and the working dockyards are never that far away wherever you choose to stay. Take your camera and enjoy a pleasant stroll from your villa in the Mediterranean sunshine. There will be much to photograph along the way. Hail a karozzin (horse drawn carriage), hire a car, grab a cab; or book a personal limo complete with chauffeur and do it in style. Whatever your choice, getting from A to B in Malta or Gozo is easy and problem free. To help you decide where you would like to base yourself, we have bought together a selection of 5 apartments and luxury villas to rent in Malta and Gozo. If you want to be at the centre of Malta’s turbulent history; its stunning 17th century architecture, its old forts, alleyways, museums, monuments, delightful squares and traditional balconies, but in a sumptuous modern setting, then Old Mint No 1 is where you need to be. From the outside a typically traditional Valletta town house, from the inside a seamless blend of traditional meets modern. Old wooden beams and brickwork give way to glazed tiles, stainless steel and glass; to provide a light, airy and modern apartment. Passing through the building’s entrance, the foyer opens up to a spacious courtyard, bathed in natural light streaming through the glass roof. Across the way, an elegant modern lift waits to whisk you to your apartment entrance. Accommodation comprises living/dining area with open plan kitchenette, shower and WC on the ground floor. The stainless steel spiral stairway takes you to two double bedrooms, one with two single beds and one with a double bed. A bathroom serves both bedrooms and the apartment has full air conditioning. 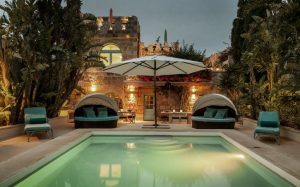 If you want away-from-it-all, then Villa Highnoon on the outskirts of the picturesque village of Mellieha is for you. Family owned, this delightful property was refurbished to an exceptionally high standard in 2017. Situated on a quiet street with free on road parking, this detached villa is surrounded by a citrus garden containing a mix of various fruit and olive trees. Far enough off the beaten track to provide that tranquil, relaxing holiday you’ve been craving for; it is also close enough to local amenities that you don’t feel totally isolated. The village of Mellieha is a pleasant ten minute stroll, and has a supermarket, bank, fishmonger and bakery, a chemist with on duty doctor; and café/bars and restaurants to cater for your every need. For your day trip to Gozo or Comino, the ferry terminal is just a 15 minute drive away. The villa comprises 3 bedrooms, 2 bathrooms, a large kitchen/diner, pool and large pool terrace, and can sleep 6 guests. On the southern side of the island, just a 10 minute drive from Malta’s International Airport, lays the beautiful rural village of Zurrieq and our next offering. This detached, 3-bed villa offers everything you would expect from high-end 5 star luxury accommodation. Eco-friendly and constructed to ensure it blends with the local countryside, the views from the property both out to sea and across the Wied Babu Valley are breath-taking. You can see as far the northern city of Mdina, the Mosta Dome, Rabat, St Julians and Valletta. Set in its own grounds with a typical Maltese garden and its own pool, there is an extensive range of out of the ordinary extras available, to ensure your stay will be one to remember. If your choice of apartment is all about luxurious living and to-die-for views, take a close look at Seagull Penthouse. With phenomenal views across Marsaxlokk Harbour, this 4-bedroom rooftop apartment can comfortably accommodate eight guests and comes with all mod-cons including air conditioning for those warmer summer nights. A couple of minutes walk from your apartment gets you to the centre of this quaint traditional Maltese fishing village. If you prefer to dine out the village has café/bars and restaurants where you can enjoy the local cuisine or international dining. Or if you prefer, there are shops to buy fresh fish, salads and vegetables. Enjoy a romantic barbeque on the large rooftop terrace. Open a second bottle of wine, and relax in the outside Jacuzzi while taking in the stunning views of Marsaxlokk by moonlight. Although smaller in size and population than Malta, Gozo appears a more rural extension of her big sister. Whether strolling through the narrow streets, stopping to admire the nimble fingers of the bobbin lace makers working in their doorways, soaking up the sun on one of the many beaches, or diving on some of the best dive spots in the Mediterranean, Gozo has something for everyone. The Dreamcatcher 2-bedroom, 2-bathroom Penthouse apartment sits five floors up, overlooking bustling (in the summer) Marsalforn harbour. A recent build which has been finished and equipped to the highest standards, this luxury penthouse boasts a massive 80sq m terrace complete with sofas and armchairs, dining table and chairs, four sun loungers, LED lighting, barbeque, and six person Jacuzzi. Access is by stairs or lift, and every room has either large windows or patio doors to the terrace. These villas to rent in Malta are the best way to recharge your batteries after a hard day on the beach, snorkeling or diving, than to unwind dining al fresco, before enjoying the muscle soothing properties of your open-air Jacuzzi.